Although you may see similar fabric matches, you won't find two identical aprons in the bunch. We have a wide selection of fabrics to mix and match in so many complementary ways. However, should you desire matching aprons, we can accommodate you, knowing your desired pairing of fabrics will not be repeated for anyone else. Our Best Friend aprons begin at run betwen $16 and $33. If you’re interested in an apron that is not yet made, please allow us to help you design your own apron with our wide selection of fabrics. Most aprons are sized to fit most adult women. Toddler, youth and adolescent sizes can be made, too. If an expanded waistband is needed, we can do that. Left handed? Let us put the pocket on the other side. Got a teacher in mind? We can add a couple of extra pockets for minimal cost. 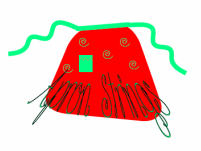 Apron Strings creates beautiful aprons with full functionality. Each full apron features a pinafore that is removable allowing you to transform it from a full apron to a pretty skirt only apron. . . . . and Things! Apron Strings and Things - the "but wait, there's more" moment has arrived! Apron Strings has added handmade and embellished napkins and dish towels to our offering. Every napkin and towel is of the highest quality and are embellished to match our aprons. Napkins are $15 for a set of four and towels are $12 per pair. We've also added grilling aprons and bakers' aprons to our line, made especially with men in mind but the kids have their own to choose from, too. They range in price from $16 - $45. Are you an urban farmer? 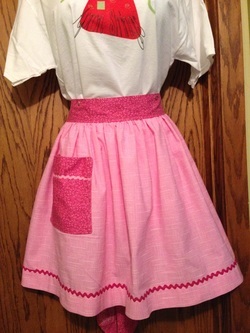 We now offer beautiful egg gathering aprons beginning at $32. Our clothespin or utility apron is priced at $22. ﻿Take a peek at the versatility of Apron Strings' one of a kind aprons.. Meet Pearl and Henrietta. This lovely combination is ready to wear as you create a spectacular meal. Simply unsnap the pinafore to serve your meal wearing your pretty skirt Best Friend Apron.